One morning the children were sitting in morning meeting. They were acting uninterested in the topic we had been studying. I asked, "What do you want to learn about." The children's body language changed and we began to discuss different topics we could investigate. The children were all saying something about cars or race cars. We changed our block center and added hub caps, wheels, grill from a old van, keys, mirrors, and steering wheel. 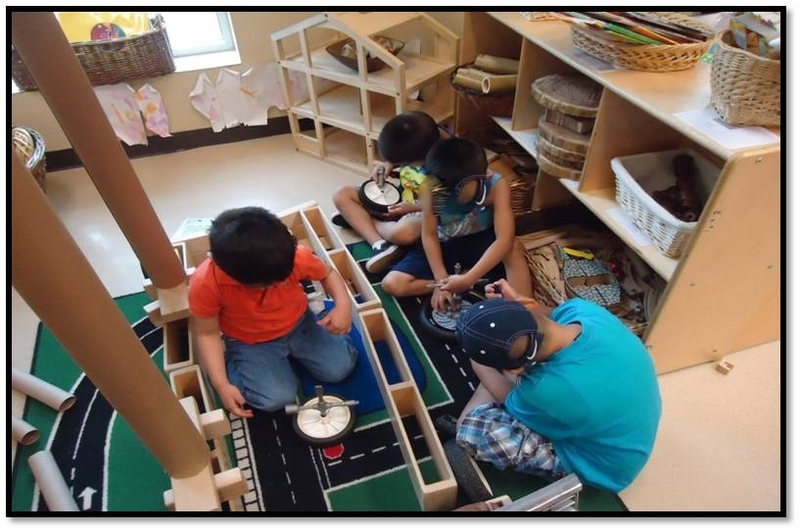 We also added different types of ramps and tunnels. We took a field trip to the parking lot. 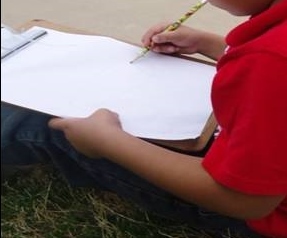 We observed and sketched the cars in the parking lot. A parent brought a car up to our school. They let the children get inside, under, opened the hood and trunk so that the children could sketch different parts of the car. The children took their sketches inside and began developing plans on building a car in blocks. 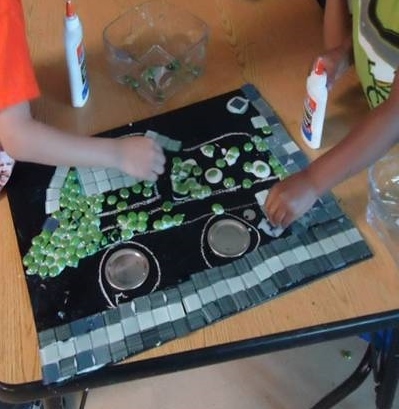 The children discussed building the car during reflection. They all agreed we needed tools to work on the car. I went and found an old socket set in my garage that was lying around and brought it in to the block center. 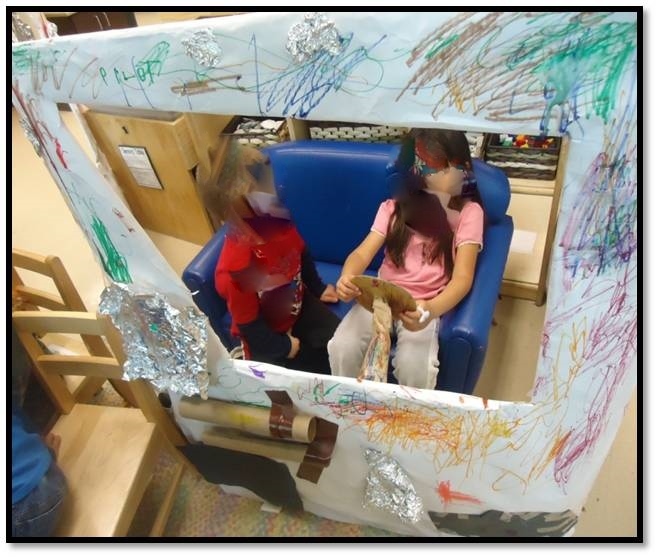 I brought in a dryer card board box in and the children add white paper to the box. They began drawing the different car parts. I cut the windows out with a box cutter on the lines that they drew. 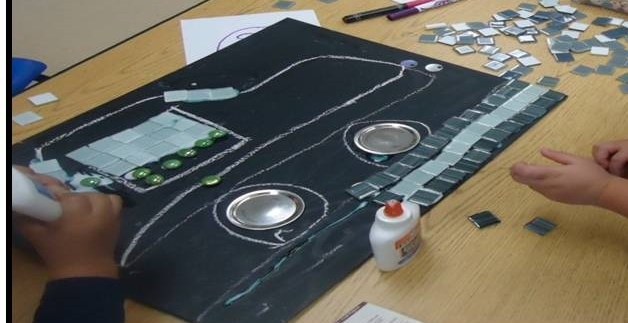 They used recyclable parts to add to the car. The children would get in and drive their car. 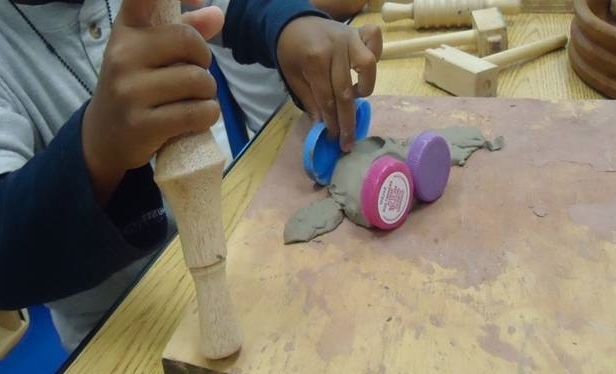 They children were drawing, painting, making clay cars. We decided to bring in stones and tiles so that the children could create a mosaic. We looked at different books that had mosaics in them and decided to try our first mosaic. 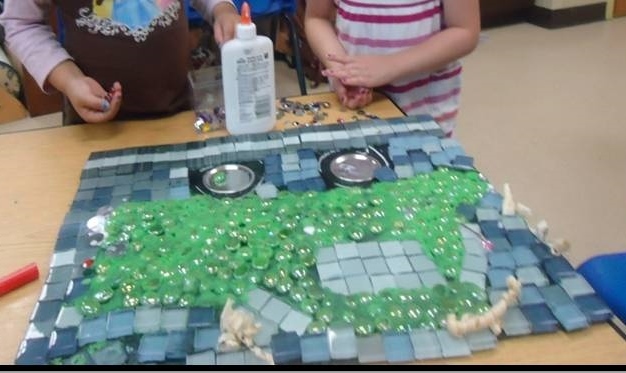 The children that wanted to work on the committee for the mosaic drew a car and they voted on the best sketch. That child drew their sketch onto the canvas. Then the committee decided what color they wanted the car, background, and other details. The children made comments while working on the canvas. Picked up clear tiles and said, "Look these will be the windows, you can see through them and that's important for windows." "We need hubcaps and antenna." They went and found objects around the room. Once the stones and tiles were on the canvas. One child said, "There is space around the stones." We went and looked in our art cabinet and the child pointed and said, "The green sand. It matches the stones. It will look best." This brought together our community and each child was allowed to use their own language to learn. This study proved to me how important following children's interest can lead to learning and fun. Sometimes we just need to ask! !